We have all heard the common phrase “don’t judge a book by its cover”, but I am sure we have all done it, especially when it comes to doing business with a company. Customers and clients likely decide whether or not to do business with a certain company based on exterior appearances. Most likely YOU have refused to do business with a company because the commercial building lacks an attractive clean appearance. If your business is being unfairly judged because of the physical characteristics, here are a few benefits that will satisfy your customers’ judgment. Unfortunately, not every business can afford a commercial face-lift. 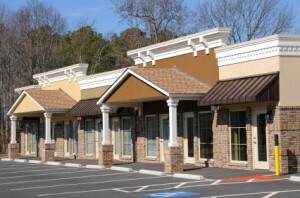 Storefront remodels can be expensive and many companies don’t have the budget to afford the makeover. Dirt, mildew and spider webs can be an unpleasant addition to your building. In order to attract more customers, pressure washing for commercial buildings is an affordable method of reviving any location. Depending on what kind of business you run, a buildings exterior can contain hazards for customers and employees. Pressure washing these problem areas can remove these dangers and protect your company from a lawsuit. In a few short hours, pressure washing the exterior can turn a building from “blah” to “wow”! The work setting is a major driver of employee engagement and of course business revenues. If employees are working in a run-down, smelly and dirty office they are less engaged to arrive happy and interact with customers or clients. This will portray a bad image on any company. Fortunately, there’s a simple, quick and inexpensive way to boost satisfaction. By hiring a professional cleaning and maintenance company, it frees up business and allows employees to concentrate on more productive and profitable activities that will benefit the company. A professional and reliable janitorial company will be able to perform all cleaning tasks necessary to keep your business well maintained. All areas of the building should be kept clean and free of dust, including the walls, ceilings, window and floors. All garbage and waste should be removed from the building on a regular basis and properly disposed. Restrooms should be kept cleaned and sanitized on a frequent basis. You may not be able to rent that new, expensive office, but you can ensure your building’s interior and exterior are sparkling clean to attract and satisfy customers.